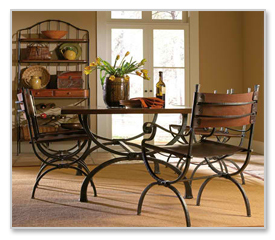 Natural elements of iron and wood with accents of brass, copper and glass make for the elegant and extraordinary beauty of Charleston Forge home furnishings. Created by skilled artisans in the High Country of the Blue Ridge Mountain Range of North Carolina, each piece reflects a unique, handmade design perfect for the discerning homeowner. French Empire styling is evident in the Legacy Arm Chair with its handsome, masculine appeal. Made to order in eighteen metal finishes from oil rubbed bronze to sorbet and three upholstery choices of black bridle leather, brown bridle leather and burnished bridle leather. This statement chair would look lovely in multiples paired with a round or rectangular table in an eat-in kitchen or dining room. A masterpiece of American made craftsmanship, the 60” Legacy Dining Table comes in eighteen metal base finishes, thirteen top finishes and ten wood finishes. Easily mix and match finishes for a custom look all your own. Distressing is standard to give a antique, patinaed look. Pair with the Legacy Arm Chair above to complete your look. Rustic, distressed wood with hand-forged iron make the 48” Retreat Bookcase a welcome addition to any room. Available in 20 wood finishes from honeysuckle on maple to sea glass and 18 metal finishes from antique pewter to vermouth. Showcase your collectables in the living room or study. Additional Charleston Forge pieces include bakers rack, benches, counter stools, bar stools and occasional tables in eight collections: Camino, Legacy, Retreat, Timber, Hudson, Parsons, Shaker and Warehouse. Explore the rest of the Charleston Forge Product Line.